Growing up, my dad was part of Customs and Excise, or Border Force as it is now (though for how long remains to be seen). As such, there was a loudly spoken rule in my house that drugs were bad and that under no circumstances should my sister or I ever partake in them. Considering that we lived in the most bumfuck nowhere type of village whilst still having a bus connection, I'm not sure looking back how they expected me to initiate such a habit, let alone maintain it. In any case, since starting further education my opinions on drug use have somewhat softened, with my perspective shifting more from the criminal to the medical. But I still hadn't ever read what addiction was like, so when Junky turned up on my shelf, I saw an opportunity to delve into a topic that is somewhat dangerous to look into first-hand. 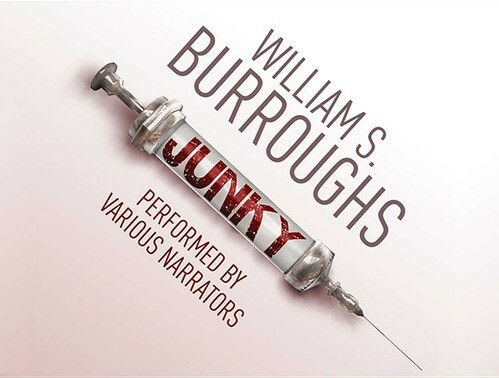 Junky is the semi-autobiographical tale of Burroughs, under the pseudonym William Lee, and his experiences of opioid addiction. It covers the experience of the drug itself, the process of pushing drugs, run-ins with the law across the United States, and several episodes of withdrawal. I don't know quite what I expected, but I hadn't expected the experience of drug addiction to be so mundane. After the first description of his initial kick, any positives are kind of toned down. It soon becomes just a background element of the narration, the way that you assume that characters in books obviously eat, sleep and clean themselves but don't need to explicitly say so unless there is something to be implied from this routine. There's a point where he states that no-one deliberately sets out to be a drug addict, and instead fall into it out of a lack of passion for anything else. It's kind of a weird realisation, and it makes the scenes of withdrawal all the more intense. You can usually see them coming as they're signposted by some downturn in personal circumstances, whether that be a lack of funds or increasing pressure from the law, but each is sufficiently different from the previous detox to maintain interest. It's in these moments where Burroughs describes trying to minimise the symptoms of "junk sickness" that the writing is at its most vivid, where all the visceral processes are drawn out with grotesque, but somehow still clinical, detail. It's a strange realisation, but the main thing that I took away from Junky is the feeling that this was just a drawn out musing on the nature of decay. Once a habit is sufficiently established, maintaining the habit is described more in terms of staving off the symptoms of junk sickness rather than for any kick that the addict may get. There doesn't seem to be any pleasure in it after a while, but just a resigned continuation of a state of self-poisoning in order to avoid the worst of the symptoms. And oftentimes, the attempts at a self-administered cure make the addict worse off than they otherwise would have. Bodies seem to decay at alarming rates, and often at odds with the personalities behind them.